Newel post universal fixing kits are designed to easily secure your handrails to your newel posts for post-to-post handrail systems. 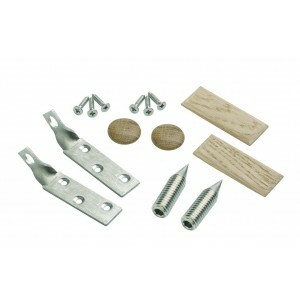 These kits contain all the necessary fittings, including white oak cover caps and filler caps to hide the fixings from view once they are in place. We have newel kits for both stair and landing handrails, so installing a new balustrade is made much easier. Stainless steel screws fix the twist bracket to the underside of the handrail. A hole should be drilled into the newel post, at right angles to the bracket, to accept a whitworth hex socket grub screw which pulls the bracket in tightly. The brackets and screws are A4 grade stainless steel. Each kit contains two brackets for affixing each side of the handrail.